Tall Ingots have a variety of scrap metal bins for your convenience. Our bins are built extra strong to handle any scrap metal material whether it be for industrial, commercial or domestic use. We have bins from 1 to 6 cubic meters available. Phone our office to get an idea of what size bin will suit your needs. We can arrange delivery of the bin to your site with our crane truck or we can utilise a forklift and other unloading equipment already at the delivery address. It is important that you specify if you have unloading and loading capabilities. All bins are weighed at Tall Ingots site with documentation provided. Please let us know if you require destruction certification for your product. Please note there are minimum quantities required to utilise our bin service. 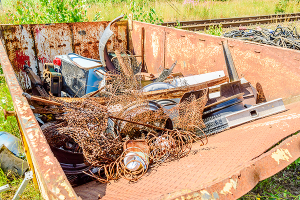 Our bin services are ideal for construction sites, major home renovations and any other site which large amounts of scrap metal need to be disposed of. If you are unsure of whether our scrap metal bin service is suitable for you, call our friendly staff. What product you have and approx quantity?